My favorite assignment in AP Psychology would definitely be the research project. We had to design our own scientific study to investigate some aspect of psychology and create, carry out, gather data, and write a scientific report about it. While most of the postry assignments in AP Lit revolve around poetry analysis, sometimes my students get a chance to craft poetry themselves-- and when they do, the results are often extraordinary. In this showcase, I'd like to share a sample "Morning Message" that I posted in my AP Lit class and a few of my students' creative responses to this message. Note: I post Morning Messages each day in my classes, and these messages usually involve some kind of instruction and a task to complete. (Some messages are heavy on instruction, while others, like this one, emphasize the response.) Most Morning Messages require less extensive responses than this one, but I thought these responses were something special. Enjoy! Allusion: a reference to something in history or previous literature. (I would add to this that allusions can also allude to works of art and mythology.) As the example of Lord Chesterfield's allusion to Joshua shows, an allusion can imply much in few words. On page 779: "Allusions are a means of reinforcing the emotion or the ideas of one's own work with the emotion or ideas of another work or occasion." Sometimes, the meaning of an allusion only works when the allusion is understood by readers, while at other times the meaning merely enriches meaning that is already clear. I would add: as you can see from this chapter, the most common allusions in literature are either to Shakespeare or the Bible. Familiarity with both will serve you well! But as Perrine's Lit says, "obviously, beginning readers will not have this range, just as they will not know the meanings of as many words as will more experienced readers. Students should therefore be prepared to look up certain allusions, just as they should look up in their dictionaries the meanings of unfamiliar words. They will find that every increase in knowledge broadens their base for understanding both literature and life" (781). You already analyzed one poem referring to the fall of Icarus (the poem portraying Icarus in the suburbs from a past exam prompt). 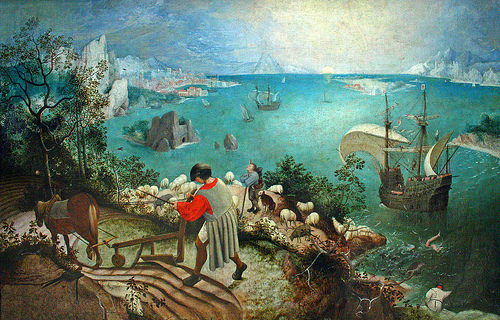 Today, I'd like you to consider two poems that allude to a painting by Peter Brueghel about the myth of the fall of Icarus. View the painting and read the story of the myth first. (By the way, you'll notice that each poem and some of the links spell Brueghel's name differently. Brueghel himself seems to have used a range of spellings, much like Shakespeare: http://breughel.8m.net/) Then consider two poems responding to the myth. --What seems to be the main point of each poem? What outlook on life to they each express? --Do they give similar or different views of the painting? Do they seem to twist the painting´s meaning or express it accurately? --What kinds of irony do you see in each poem? --How would you compare the tone of the two poems? --What do you notice about the diction of the two poems? --What kinds of imagery and figurative language do you see in the two poems? --What is your overall impression of the two poems? Which do you think was more effective? Which did you find easier to understand? Which did you find more meaningful? Why? Write your own free verse (i.e., non-rhyming, with few rules) poem that responds to Brueghel´s painting. If you wish, you can also allude to Williams´s or Auden´s poems. What meaning do you see in the painting? What aspect of the painting would you focus on? Will you take a stance that is similar or different to the responses of Williams and Auden? How might you connect this painting and this myth to modern life? Is the myth of Icarus still meaningful? Important: after your poem, include a paragraph or so about your experience writing this poem and the choices that you made in writing this poem. By the way, you can avoid white space between lines if you click on the "HTML" button below and change the <p> codes to <br> for certain lines. Congratulations for taking the risk of posting original poetry! I very much hope that a few of you will take this plunge and make this attempt. I look forward to seeing what you choose! Please write either "Option 1" or "Option 2" in the subject line of your reply. Here are some of my students' "Option 2" responses to this message, shared with their permission. I hope you enjoy reading their poems as much as I did! Maybe a great intrepid sun-seeker never really fell at all. At the least it was waste! We're all still here, see? Check check, check check check! Plowman's complaint: I am vastly underpayed. Shepherd: your flock fares well, I count 99 safe at bay. Suspect it was a stowaway come to his senses. and bless all who receive these ashes. ****THE WRITING OF THIS LITTLE POEM....was super fun actually! I tried hard to make it be GOOD, and I spend about 40 minutes altogether. It was really nice to write. I tried to wrap in a lot of the things I sawin the painting: mainly, the priest at the bottom (took me a while to see him! ), the plowman, the ship sailing off to the horizon, and the shepherd tending his flock. I tried to include a bit of symbolism with the "99 sheep" and such. Also, the prayer at the end is a catholic blessing (ps I'm not catholic though) that doesn't work at all in context but makes sense in the artistic bounds of the poem and the grander scope of what I'm trying to say. Icarus was BURNED after all, so the ashes part was cool to me. Hope it makes sense! I liked this assignment a lot. Even though my poem really only makes sense in light of the painting, which I don't like.....I still loved writing it. I like it. :) I wrote it in 10 minutes, and I tried to deviate the attention away from Icarus. the sun still sets (or rises?) over the brink of the sea. is that all stories must be spoiled in some similar way eventually. and the sun still sets (or rises?) over the brink of the sea. The feeling I got from the painting and the poems about it reminded me a little of a line from a story I wrote recently, so that made its way into the first stanza, complete with a description of why my narrator said it. I decided to repeat the motif by quoting another character of mine in the second stanza. I started out only emphasizing the incongruity of the life/death juxtaposition, but then wanted to point out something else about it than just that it was incongruous - so I remembered something else I try to use in my writing: dire occurances ought to fit in with the rest of the situation, otherwise they can seem unfair. So I tried to capitalize on that in the poem - and then realized that, to some extent, the continuance of life is a triumph of sorts. Another thing that struck me about the painting was that I couldn't tell if the sun were rising or setting, so I tried to bring that into the poem! It seemed like a good metaphor for the continuing of life. The sun might be setting for some people at the same time as it is rising for others.